Mark Levinson's No.585 integrated amp on sale in December | What Hi-Fi? It's been six months since we were first introduced to the new Mark Levinson No.585 as a "Swiss army knife product", but this high-end integrated amplifier is now about to hit the shelves. The No.585 is the first of 17 products to emerge from Harman Luxury Audio Group's new state-of-the-art engineering facility in Connecticut, US and arrives in December for a cool £10,500. Robert Lardon is general manager of Harman Luxury Audio Group and describes the No.585 as a "Swiss army knife product" simply because of the number of things that it's able to do. A Class AB amplifier delivers 200W per channel into 8 ohms and 350W per channel into 4 ohms, with the unit able to support a variety of digital sources – including high-res 32-bit/192kHz. In addition, Harman implemented its own proprietary Clari-Fi processing technology designed to apply signal-enhancement to any compressed music file format to boost the sound quality. The heart of the No.585's digital audio processing stage features an ESS Sabre 32-bit DAC, with separate left- and right-channel regulated linear power supplies used for the analogue circuitry. Meanwhile, the No.585 has six digital and four analogue inputs – including USB, optical, coaxial, AES/EBU XLR and RCA. There's also a stereo pre-amp/sub output to expand your system. In terms of the design, the No.585 can be operated via its dual front-panel knobs and six function buttons or using its remote control. The aluminium panel has a two-tone black and silver finish. 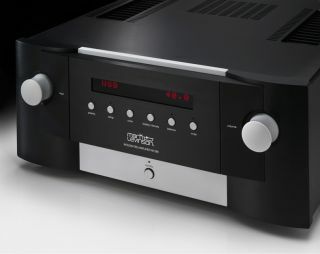 And following the launch of the No.585, we're expecting to see the Mark Levinson No.585P with built-in phono stage appear in 2015 as more products start to emerge from Connecticut.